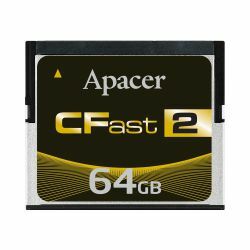 Switch (Optional)Since CompactFlash Association released the specification of CFast 2.0, Apacer takes the lead to roll out the first industrial-grade SATA 3.0 (6Gb/s) high-speed transmission interface CFast 2.0 memory card around the globe. Its sequential speed is up to 285/260 MB/sec and dimensions is 42.8mm x 36.4mm x 3.6mm with (7+17) pin connector. Besides featuring a 2-Channel bidirectional structure, the CFast 2.0 adopts Toggle DDR 2.0 NAND Flash, which brings its performance to a higher level. Support for DEVSLP (Device Sleep) power mode enables them to switch into a low power state on standby mode so as to save power for companies.